I learned through LiveActionFilms on Twitter that Mildred Jefferson, one of the original founders of the National Right to Life Committee, has passed away. She was 84 years old. Dr. Jefferson was the first black woman to graduate from Harvard Medical School, among many other accomplishments. 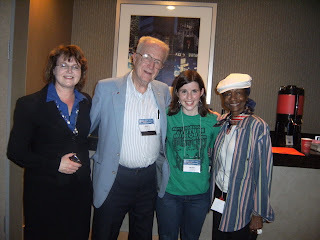 I had the opportunity to meet Dr. Jefferson briefly at the National Right to Life Committee conference in June. She was active in the pro-life movement even in her last months. I remember a time when she called the office of a pro-life org I worked for, and she was transfered to me for a quick question. About 25 minutes had passed before a voice went over the intercom, asking "whoever has been talking to Dr. Jefferson all this time, please pass her along to Brenda." We didn't realize that much time had passed. We'd been talking about youth outreach, and how she had seen things change so much over the years, from an adult-focus, to a youth-focus, then to youth-inclusive and now youth-led. She was such a fantastic woman, and she'll be missed.